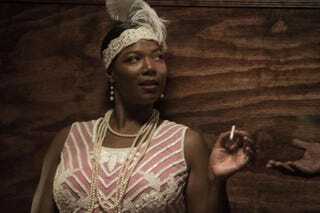 Here's your first look at Queen Latifah as blues legend Bessie Smith for HBO's bio-pic Bessie. Based on her expression, she knows something you don't know. Directed by Dee Rees (Pariah) and co-starring Michael K.Williams, Khandi Alexander, Oliver Platt, Mike Epps, Bryan Greenberg and Mo'Nique, Bessie will premiere in 2015. Speaking of Queen Latifah, E! is reporting that she'll be using her own money to pay the crew of the newly canceled The Queen Latifah Show through the holidays. The woman is goddamn saint.